Well it has certainly been a long time between drinks, but here I am, just in time to post one last thing before the year end. I thank Spoke Design for the inspiration to burst into e-print once again. I was alerted to the Spoke Design mechanical pencil project back in July this year, and a little while ago they very kindly sent me a freebie pencil. I really like the pencil, so here's a few pictures and words on it. I will not go into the detail of the mechanism etc as it is a Pentel Sharp P205 series mechanism fitted into a new aluminium body. As you can see they sent me a mechanical pencil, notepad and a sticker. 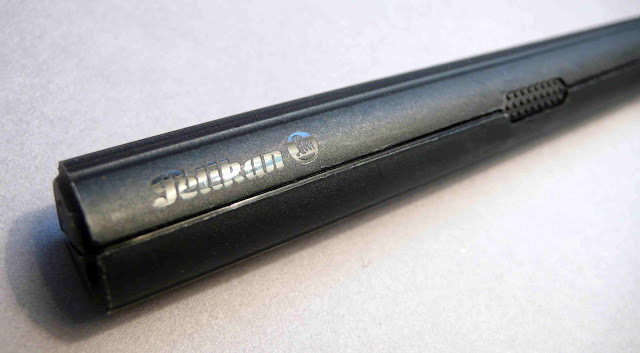 The mechanical pencil is packaged in a printed clear hard plastic tube which also secures the lead sleeve in place so the pencil is held very securely in position. The Spoke Pencils self-adhesive label, pictured with the pencil stand or dock, and pencil. I chose the black pencil because that's a standard colour for me, but frankly it was a mistake. 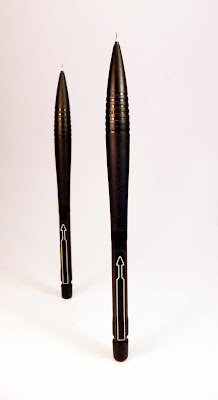 The spoke cut-outs in the body allow you to see the internal lead reservoir tube of the pencil, but it too is black, and so with black on black you loose a great visual effect. Check out the gallery at Spoke Pencils to see what I mean. 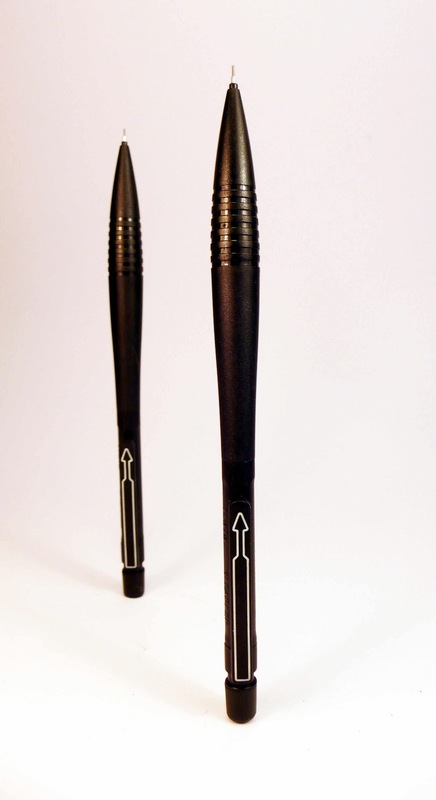 Having said that, black is always in fashion, and the Spoke Pencil is a class act. Note the cut-outs in the body, running down to the flared grip section. Like the body, the grip is hexagonal and smooth, however the flare at the tip of the body helps secure your fingers in place. Note the single dot at the top of the body. That indicates this is from the first manufacturing run. The pencil stand or dock is a very nice addition. It has an adhesive pad underneath should you wish to stick it in place, but it holds the pencil upright without difficulty on any flat level surface. The original Kickstarter project saw nearly 800 pencils manufactured and shipped out. It was a stand alone project and production run so there may or may not be future production runs. I hope they will make more, because it is a good pencil and an interesting design. If Spoke carry on like they have started, then the guys at Porsche Design should keep an eye on their rear-view mirror as one day they might just see a Spoke cruising up behind them. With that in mind I offer some comments for possible modification of future pencils. This is a great pencil, be proud, put your brand name on it. I would also love to see "USA" on it too. The pencil stand is a great idea and works really well. 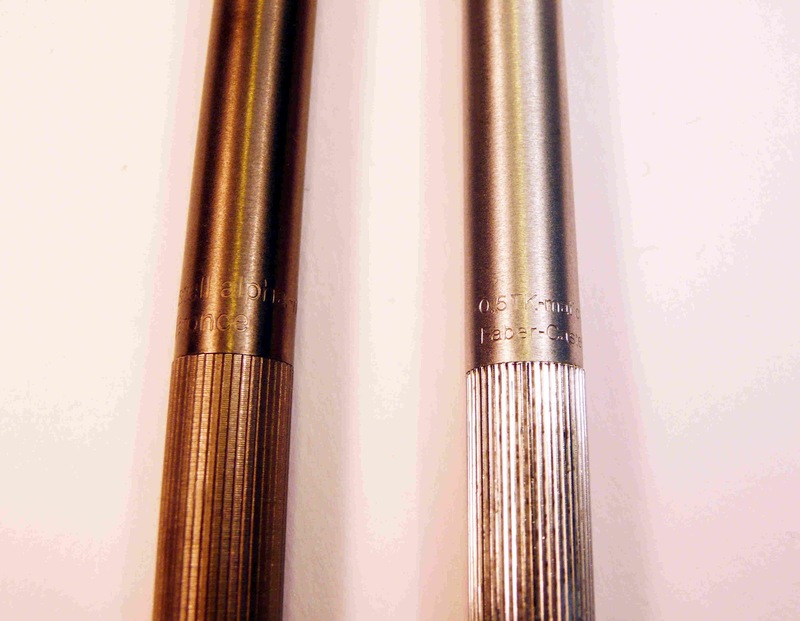 I wonder though that over time the metal on metal contact with the pencil tip section may lead to some wear on both. Perhaps a plastic insert in the stand is worth considering. The edges of the hexagonal body are just a little sharp for me. Some more rumbling or perhaps some deliberate rounding in the finger grip zone would be in order. In the right light, at the right angle, with good eyesight... boy, I'm being very picky here... you can see some very minor tool marks. A little more rumbling might help. If Spoke make more pencils, and you don't already have one, then I suggest it is a worthy addition to any collection. 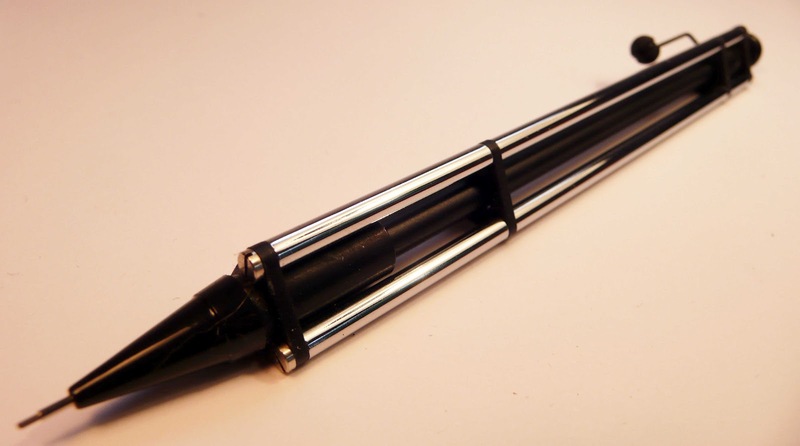 The Spoke Mechanical Pencil - definitely one to help the thought process. Well I have left the best till last, these are my all time favorites. I wanted to show the alpha range, so here we have I feel the finest mechanical pencils available. The sheer quality of manufacture becomes immediately apparent as soon as you handle these pencils. The silver TK-matic shown was purchased in 1980, the year of inception to the German market and it has worked flawlessly for me throughout all the years of sweated magazine print deadlines, rattling around in the bottom of a brief case, running for the train in rush hour, bomb threats, 3 day weeks, power outs, being dropped and borrowed! In fact the whole gamut of working life in a busy London studio. It has never missed a beat or fluffed a line, this pencil deserves a medal for outstanding devotion to duty! It is the only true draughting pencil in The Magnificent Seven, having a lead sleeve for use with rulers etc, and was often used with blue 0.5 lead for print proof marking up, a job that is now of course done on screen. The pencil itself is a solid, reliable heavyweight, that is made from stainless steel with the cunning auto lead advance feature, which is shared by all pencils shown here. 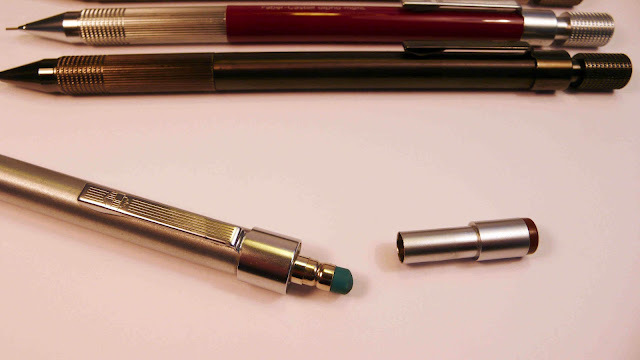 As you write/draw the lead advances according to usage, you don't have to worry about leads till fitting a new one, which is just a question of pumping the cap button till one appears at the point. The cap is removable to access the small eraser with cleaning wire which I have never had to use, and the lead store below within the body. The knurled grip is superbly positioned and I feel the whole mass and ample weight of the pencils 26gams improves accuracy and control. The other pencils shown here have been acquired along the way from various sources. These are all general use mechanical pencils in the alpha-matic range, lacking the drafting sleeve. Again the build quality is top class and they range in finish from the maroon red plastic, to the charmingly named 'Bronce' and to the most expensive 'Titanium' almost black finish. All are equally fine and able pencils. I would recommend anyone wanting the best in an 0.5mm pencil to seek out any one of these superb examples of German excellence. Was it Oscar Wilde who sated that "one never regrets purchasing quality"? Paul - Thanks very much for showing these fantastic pencils from your collection. Perhaps after some rest at the saloon and bunk house 'The Magnificent Seven' may ride again? The Parker Itala - a wasted opportunity. 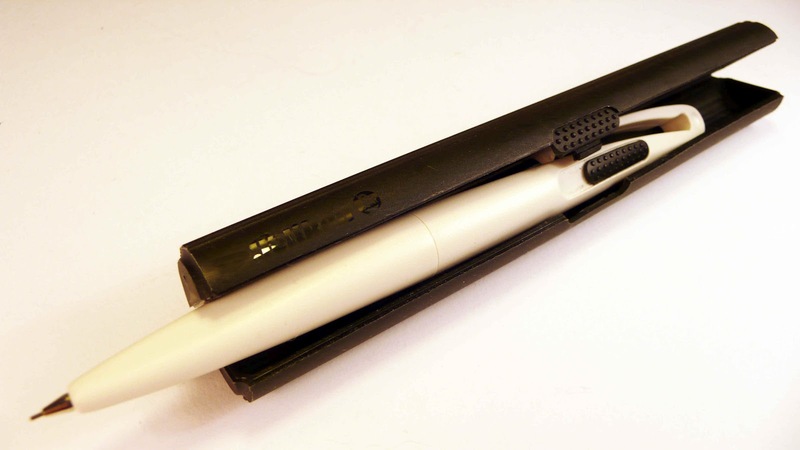 The pencil and matching pens were designed by Giorgetto Giugiaro for Parker in 1983, as prototypes. There was an absolute meltdown by Mr Parker Sr himself when he discovered that the pens were designed to be disposable, a disposable Parker... Blasphemy! So the president of the writing instruments group who was developing these items was fired, and the pen versions never went into production, and the pencil is quite a rare item. If you find one for sale buy it. The pencil shown here is by far the lightest in all my pencil reviews, at around 7g in weight. 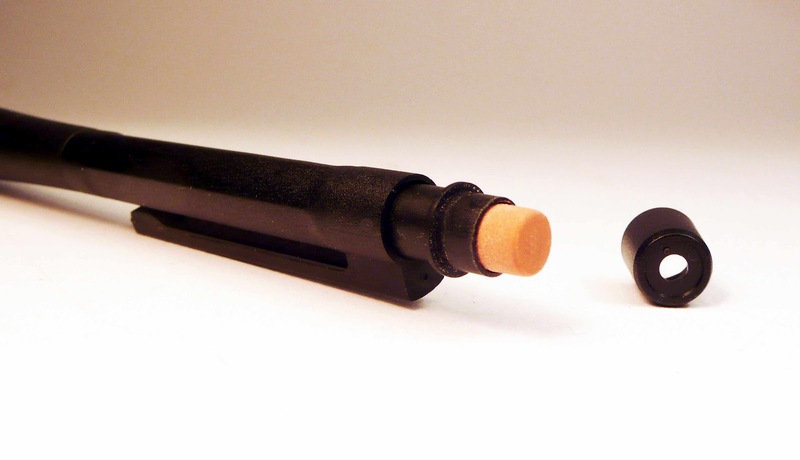 It consists of a very simple set of 4 plastic castings - nose/body, top/clip, plug with eraser, and a cap with a hole in to show the top of eraser, all in textured easy-grip with polished highlights. There is also a tiny metal lead sleeve so its technically a drafting pencil. 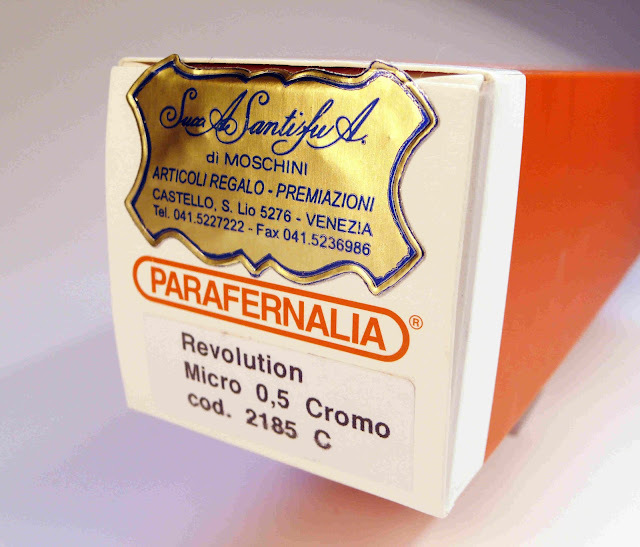 This must have been a very cheap item to manufacture and assemble, yet it possesses all the grace of its Italian lineage and is a superb shape in the hand. Coupled with the extreme light weight this makes for perfectly tireless writing/drawing. Sporting 0.5mm leads filled from the plug opening and push button lead advance this has to be rated as a superb first design for Giorgetto Giugiaro. Apart from the Parker Itala molded branding on the pencil there is also the very clever graphic device printed in white referencing the original Parker fountain pen arrow clip design. On seeing this one immediately thinks Parker. To sum up, a great design for a whole writing set, ballpoint pen, felt tip, and pencil range abandoned by backward thinking on the part of senior management. This is a design as fresh and strong now as it was in the 1980's. Warranting re-introduction this time around with proper support and encouragement. The SOCIAL SLENCIL, mechanical pencil invention and lifelong work of Carl C Harris. The pencil shown is a recent introduction to the Slencil line for me. I could not resist the central lead advance wheel coupled with the slightly Buck Rogers styling. The first models were introduced in 1933 and named the Stag, my pencil as shown is the later Social Slencil, copyright shows 1945 on the paperwork. Running alongside the pencil range were companion slim notepads also produced by The Slencil Company of Orange, Mass, U.S.A, and when you consider the bulk and fuss of carrying a fountain pen and address book of the period it all makes very good sense - a place to record the date of the Pony Club Diner & Dance or a swift note home to the folks from the front line. 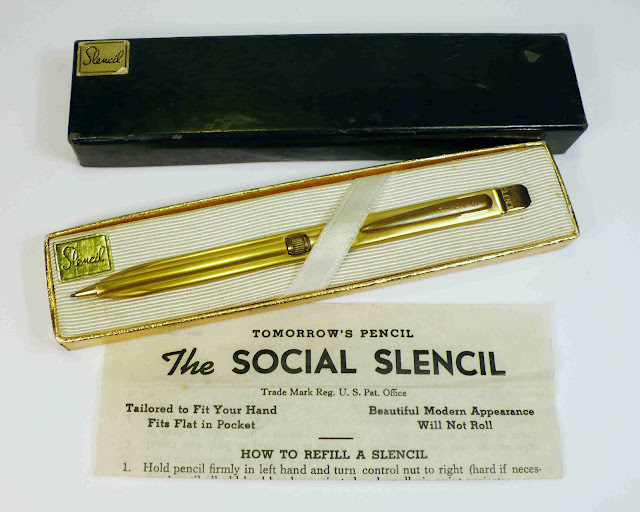 The super little Social Slencil, the way to take notes long before the advent of the personal electronic PA, barely 115mm long and approx. 2mm thick! 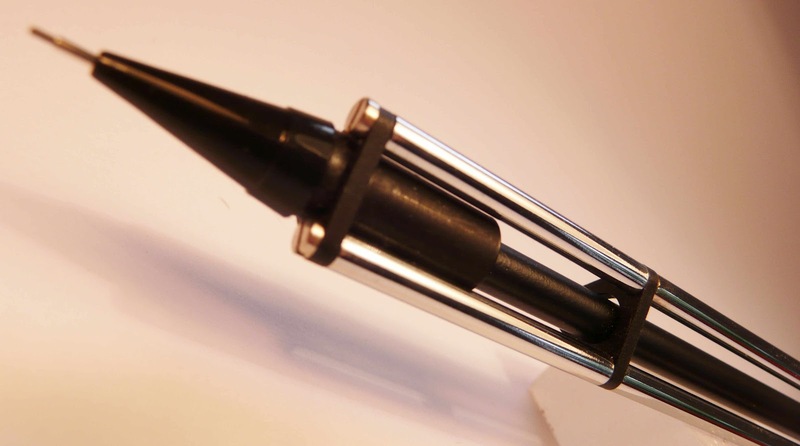 The pencil is loaded by inserting 1mm lead into the nose point and pressing it into the clutch mechanism, then it can be adjusted by means of the centre wheel. The eraser is inside the end removable cap along with storage space for spare leads. That this tiny item of engineering was a success is born out by the fact that the company is still going strong producing new plastic versions of TOMORROW'S PENCIL. Despite the ravages and destruction of war, the German pen industry of the early 1950's still boasted many many pen makers both large and small, and among them was a company called 'Tropen'. They produced an huge selection of items from fountain pens and stylographs, to the humble mechanical pencil. The post 1930s offerings all seem to share a common Art Deco design theme, which is what attracted me initially to this company. 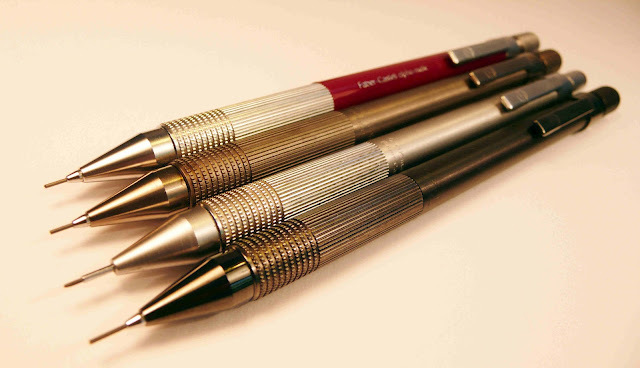 I have a couple of the 1.2mm lead pencils, they are loaded by unscrewing the barrel halves and filling the bottom half with short leads, advancing the lead is achieved by rotating the nose. Finish is a plain colour usually gloss black with gold plated/washed trim, the nose being brass. 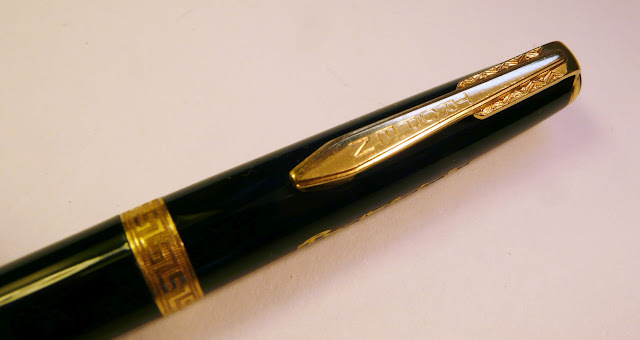 Top of the line fountain pens had GF trim, plus excellent solid gold nibs. 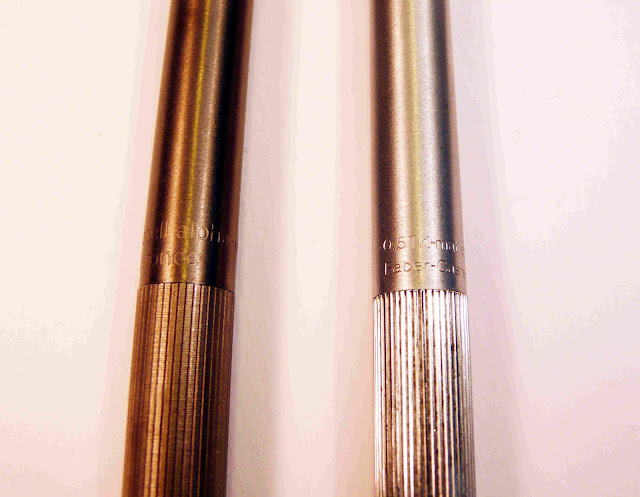 The grey pencil shown is inscribed 'Made in Germany' suggesting that it is of pre-war manufacture. 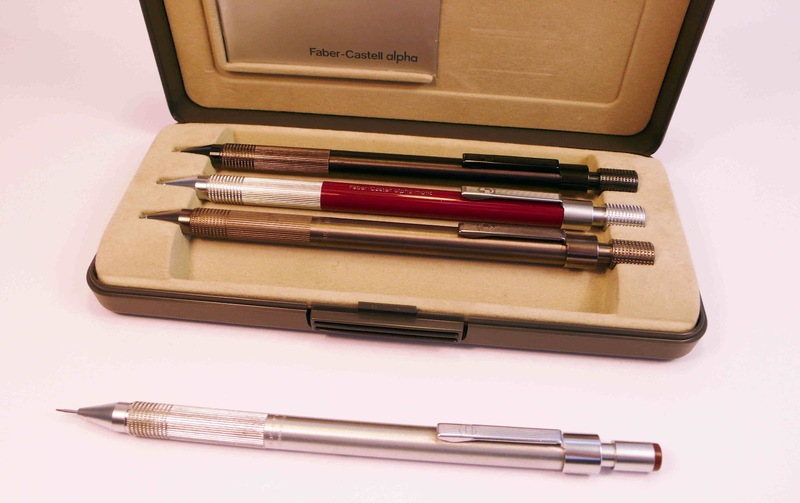 As with most things German and mechanical they have an innate sense of quality about them and work simply and flawlessly, that aspect along with the sharp deco looks offer a very affordable and usable collectable. A large number of vintage Tropen items are still available on certain websites today. 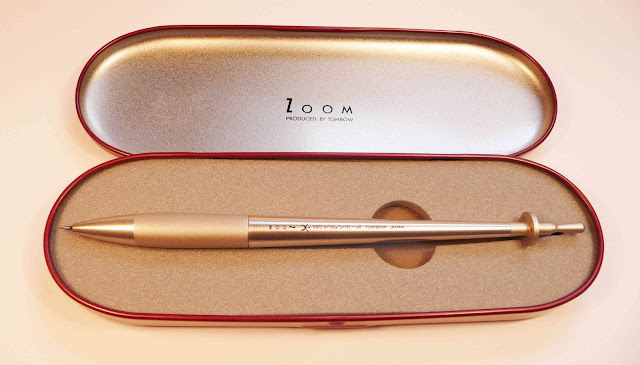 The Tropen company along with many other German manufacturers disappeared in the mid 1950s victims of changing times and taste, and the rise of that ultra modern invention the ballpoint pen. This has to be one of my all time favorite Japanese pencils, again a 0.5 mechanical pencil. For me 0.5 is almost a default setting for pencils, this stems from my career as a graphic design editor. When I started out people actually used pencils in the work place and a 'tablet' was something one took for a headache. Back to the business in hand, this is a beautifully built and finished push button lead advance pencil, with no other tricks up its sleeve, believe me it doesn't need any. Very light in weight therefore effortless even on the long haul, aluminum construction with some cast metal parts. The grip for instance is cast metal and provides just the right amount of 'holding' power showing what can be achieved without recourse to rubber, which I find always breaks up or melts in your hand like in those chocolate ads. The top button is removed by a gentle tug revealing the lead chamber. This thin end is too slight to carry an eraser. Meanwhile down at the front this could almost qualify as a drafting pencil as it does have a short lead sleeve. Not an easy pencil to carry as there is no clip and the lead has to be persuaded back from whence it came by pressing nose down while pressing the advance button - much more civilized to transport it in its own smart maroon red tin. 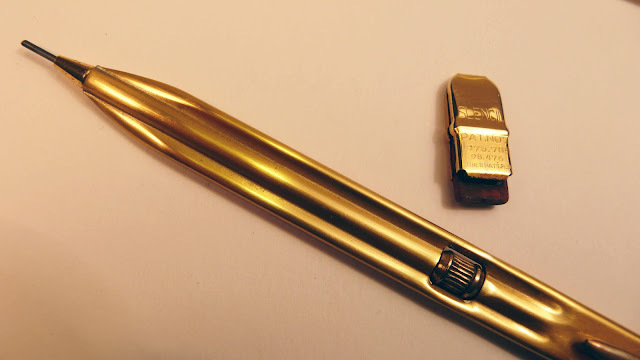 To sum up a lovely writing/drawing instrument both to use and to admire. If you see one on sale, buy it you will not be disappointed. Many years ago I did a silly thing. I visited the “Website That Must Not Be Mentioned”… I didn’t have adult supervision… I was quickly ensnared. When I finally escaped I had gained a very nice mechanical pencil, but I soon regretted "the arm and a leg” it had cost me. Years have now passed, my arm has regenerated, and so now I can write a little review of the pencil in question. It’s a very nice pencil. It was sold to me as an “Eversharp Model 4112TC Jade Green mechanical pencil, from the 1932 catalogue”. In Jonathan Valeys recently published “The Catalogue of American Mechanical Pencils” it appears on page 64 in sub-section 12 "Eversharp 'Dollar Pencils' 1927-1935" and according to the text it would have been produced in the early 1930’s and was described in the Eversharp catalogues as a “popular priced” line, hence the Dollar Pencils terminology. Dollar Pencil, well let’s just say I paid a lot more than a dollar. In fact I paid a lot more than the $10-20 price guide stated in the “The Catalogue of American Mechanical Pencils”. Despite being a “popular priced” dollar pencil, beauty is in the eye of the beholder and it’s still something of a beauty, especially considering it’s age. The jade green marbled plastic body is still in bright glossy condition, and the gold fittings are in great condition. If you look hard you can see some marks from use, but there’s no brassing on the gold fittings and they are pretty close to original condition. The colour of the green marble body is nice, but the lustre and depth of colour do not match that of pencils like the Conway Stewart Nippy No 3, although that’s perhaps not a fair comparison given the difference in time and price between the two. The pocket clip is very sturdy and strong. Proudly embossed with the Eversharp name, and “Made in USA”. The gold plating still seems as good as new to me. The full length, normal diameter body and tapering tip section mean this is a good writing pencil for everyday use. Typical of its time, this is a screw mechanism pencil. 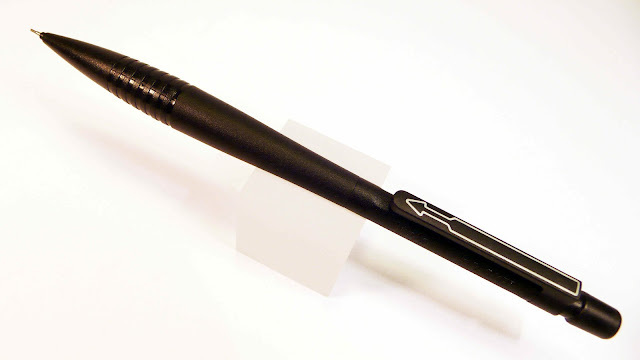 You twist the tip section around to advance the 1.18mm lead. 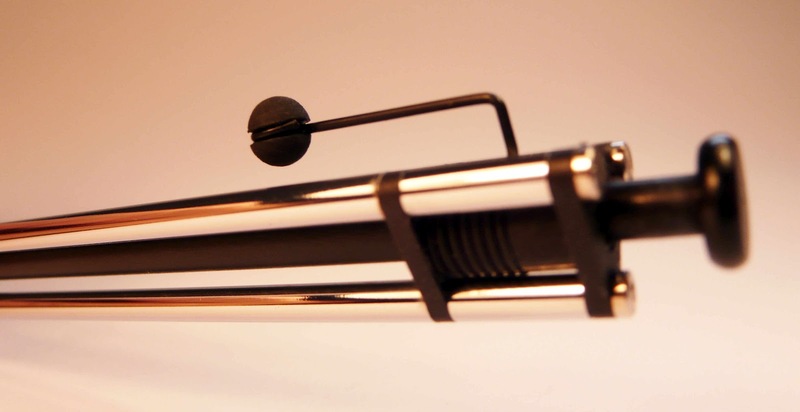 The lead is advanced by a simple push rod so it is not grasped and help. That means the lead doesn’t retract unless you reverse twist the mechanism and then manually push the lead back in. Also the lead not being grasped means it will always twist and orientate so you are writing with the chisel edge formed on the tip of the lead. A fairly blunt writing experience by todays standards. Well anyway, that’s how mine operates. It is possible other examples maybe different. There is an eraser under the top end cap. Although somewhat hardened with age, the eraser in mine is in far too good a condition to be original and must be a replacement from a more recent decade. There appears to be the usual lead storage under the eraser. I’m not a mega-millionaire so of course price has some part in the equation, but collecting is my hobby, it’s not a commercial activity for me. Like anyone I would rather get a bargain than get ripped off, but I paid what I paid in an open market auction. I received exactly what I bid for. Eighty years on from its date of manufacture, I am very happy to be the owner of this Eversharp mechanical pencil. If anyone out there actually has an old Eversharp catalogue that shows this pencil I would really appreciate confirmation of the actual model number 4112TC.